Are you ready to get your groove on? School has started and fall is already here. Yikes! Pre-class guided shopping trip price is a $35 flat fee no matter how much time is needed. This does NOT include items you choose to purchase. Class price $65 per person for 2.5 hours of time in YOUR home. You will provide your own sewing machine and supplies. Need help choosing a sewing machine? Please ask! Help is available!!! If you choose to shop for a machine independently, be advised that a machine with a retail price point below $150 is NOT a machine acceptable for classes as those machines have too many limitations. Considering a serger? Please avoid Singer brand sergers – both new or used – as many have tension issues. Call for current recommendations before purchasing. For more information on this, please contact me. Additional time beyond 2 1/2 hours is $10/ 30 minute increment. 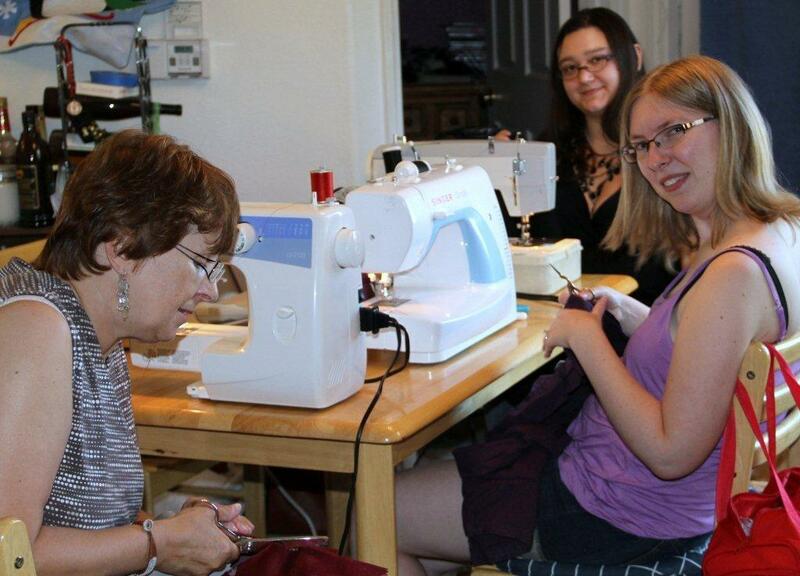 Serger Class is two sessions, each 2 1/2 hours in length for $65 each. This is a very busy, intense class. More information can be found in the above tabs. Confirmation required day before class via phone, text or email. Confirmation is the student’s responsibility. Cancellation fee of $20 will be applied if cancelling less than 2 (TWO) hours in advance of your class. Due & payable at your next class. This is easily avoided by contacting via phone or text! Las Vegas Sewing Instruction is designed for novice to more advanced sewers interested in clothing construction for themselves and others. Assistance with Home Dec items available but may vary. Lessons are given in your home individually. Group classes available on a limited basis – please ask. I have experience with sewing for 40+ years, including serger work and some machine embroidery. Whether you want to learn basics or more advanced techniques, this is the class for you! Sewing lessons will be tailored to your ability level. Students ages 10 to 80+ are welcome! If you are under age 12, a parent must be present during class time, no exception. Parents are welcome & encouraged to check on their children at any time during a class in your home! LOOK at the drop-down tabs at the top of this page for more information. Most everything you need to know will be found here. After you read those, then give me a call! Dream something up — and we will figure it out together!